Every time I blink, I feel grit rolling around under my eye lid. My hands are sucking up every bit of moisture I give them and are still asking for more. My index finger is already developing a deep crack in the joint of my index finger making it painful to bend it. This dry arid environment is taking a toll on my body. Nothing I am doing rectifies the problem. I move from my preferred position of behind Mike to take lead, just to give my eyes a break from the dust that just hangs in the air. I keep one eye on the road and the other on a group of animals in the distance slowly moving across the plains towards me. I’m too excited to leave that remaining eye on the road and slam on the breaks. Turning off my motorcycle, I fumble to get my camera out and swap to my long lens. Mike pulls up next to me, and turns his bike off. Silence. With the change in sound, the whole group suddenly takes off, running directly towards us. I want to rub my eyes, this is so exciting. Cloaked in a cloud of dust, a blur of legs, black and white stripes, horns fly across the road. One or two just stand in the middle of the road and look at us with curious eyes. This (as I look around me) is Africa, this exact moment is what I imagined Africa was when I was a little girl. 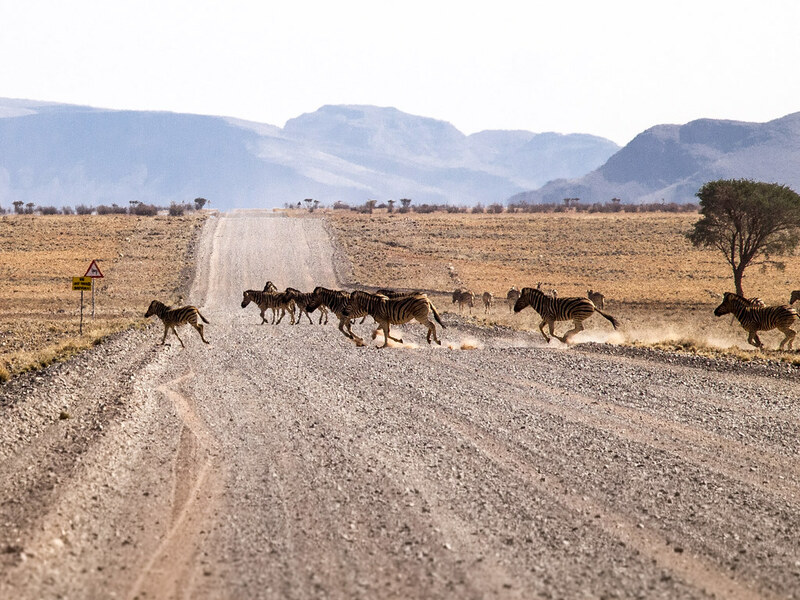 The herd of zebra’s, antelopes and jackals has crossed the road and moved deeper into the plains onto the left of us, as we leave them behind and carry on towards our destination – Sossusvlei, one of Namibia most famous attractions. We have packed up our camping site early, and we are hoping to cover the meer 168 kilometers to Soussusvlei, relatively quickly. But what I didn’t realise is that we would be travelling through the NamibRand Nature Reserve and I would get to see all these animals. It was indeed a nice surprise. When people think of Africa, they think of hot desert conditions that never get cold and of course lions roaming everywhere waiting to eat us. But in actual fact, lions are contained to certain areas, and it definitely does get cold! Since leaving Cape Town, Mike and I have been riding with at least four layers of clothing on, including our waterproof gear. At times we both have been doubling up on our gloves just to keep our fingers from falling off. As we slowly drive north, we can feel the temperatures slowly rise. At every water break we take, we both take off a layer of clothing. Stuffing each discarded layer under our nets until I am finally down to riding in my t-shirt and armour jacket. 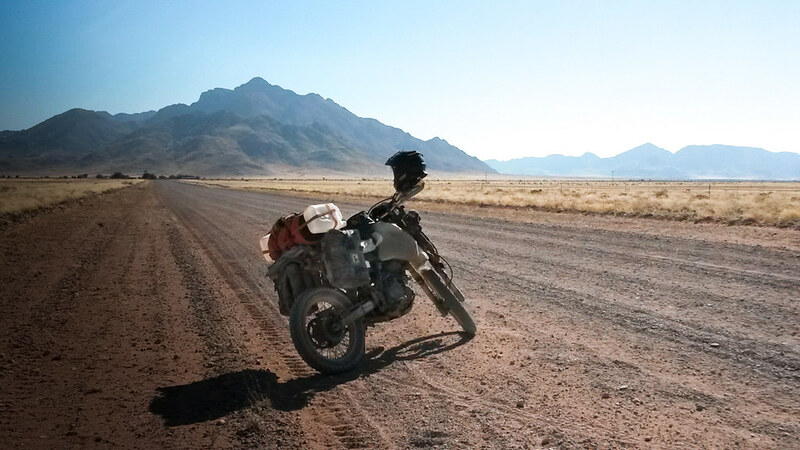 It came to me during my helment time, the last time I rode like this was when we were in Mozambique over a year ago! 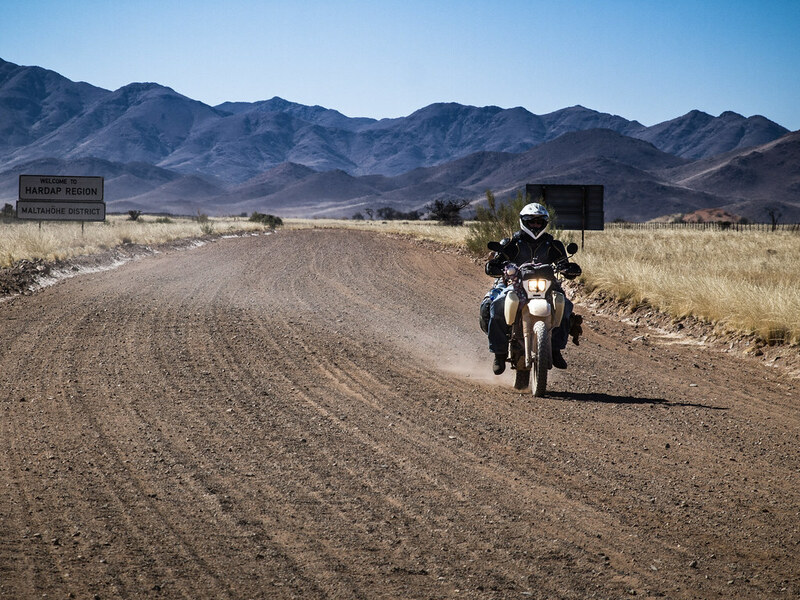 As I ride over a small rise, I feel the lack in concentration and fatigue setting in, despite knowing how close we are to Soussusvlei. I ride down the other side of the slope and notice an Oryx standing on the left hand side verge. I smile to myself at its beauty, and check my speed. I’m travelling too fast to slow down – let alone stop in time. As I get closer to it, it decides to take off at a gallop and crosses the road in front of me. I know I’m not close enough to collide with it, but it still gives me a thrill. What I didn’t notice is that on the right of me a whole group of them stands on the other side of a fence. My Oryx runs full speed, unknowingly, into that fence. Stunned and surprised, it gets back onto its feet and charges at the fence, using his long slender horns to get up and under it to join his friends. I sigh a breath of relief that he wasn’t hurt, but I feel pretty bad about frightening the poor thing. Maybe he thought I was a noisy lion! For days now, Mike has been teasing me about the way I pronounce “Sossusvlei”. Instead it comes out more like “Sausage Fly”. 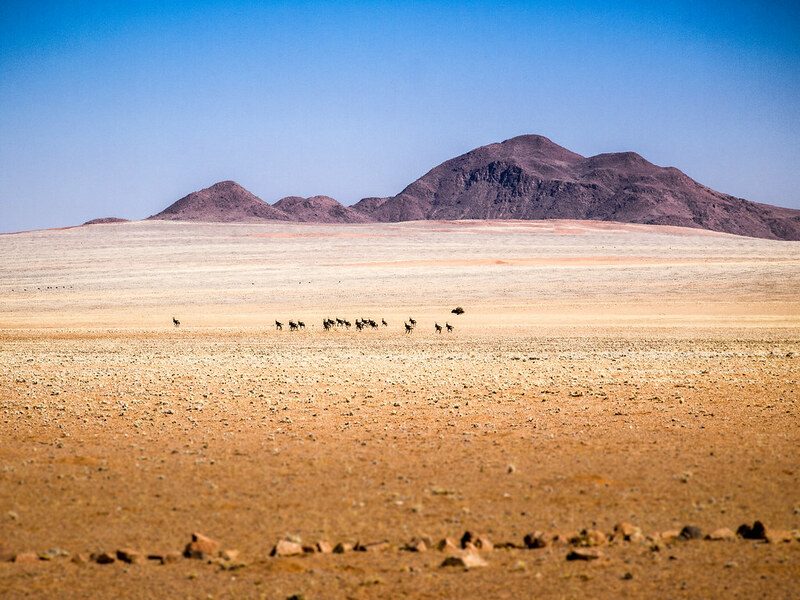 Sossusvlei, is a popular tourist destination, and not without reason. Once in a blue moon the valley fills up with water, which runs deep into the desert before dissipating. Because the dunes are constantly shifting, parts of valley that once held several thriving acacia trees now have been cut off from water, this area is now called Dead Vlei. The trees still stand, completely dried out and looks amazing against the white clay floor and the deep red dunes surrounding the basin. 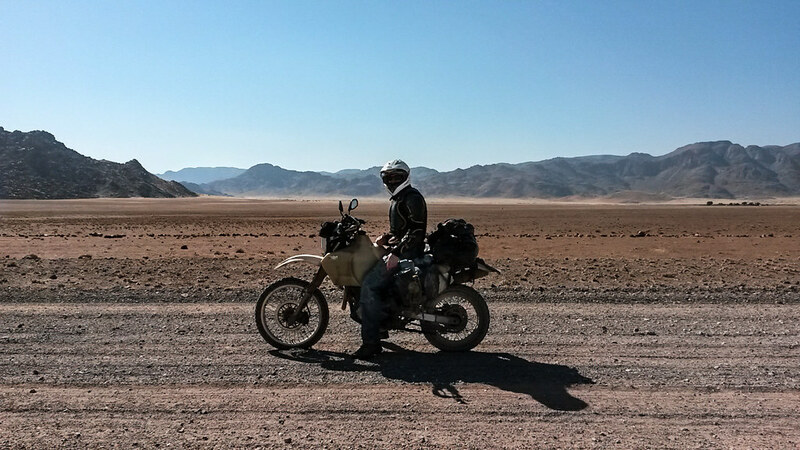 I am looking forward to having a couple of days off the bike to explore Sossusvlei. I am hoping while I am here I will learn how to say Sossusvlei properly. Let my eyes will return to normal without the constant cloud of dust blowing in them and to try to get the moisture back into my hands. I guess this is all part of the fun of traveling in the desert. While reading I saw you, the animals, the surroundings like in a movie in front of my eyes! Great story, well told! As always… great vivid descriptions. EASY to imagine abd fell as if I am along for the ride. Thanks for taking the time to share. Just like the other two comments, so beautiful to read. I was so excited for you, especially with the oryx! well done, keep them coming. I am sad not coming to Namibia. Hi Edwin, I am so glad you get that feeling. It is what I strive to achieve, making sure you as a reader experiences this journey with me. Hi J, Fantastic! I wish you were here joining me on your own bike! Hi Chris, My experience with the Oryx was pretty exciting! I could feel my heart pumping in my chest! But then, only for it to get frightened and run away from me made me feel increadly bad for it. I hope it didn’t do any serious damage. It’s great to read your stories. You must feel very lucky to see and ride amidst those beautiful animals! Enjoy and keep safe. Hi Yvonne, Thank you for reading my stories and enjoying them. It has been a dream of mine to come to Africa since I was a small girl and heard my dad talking about his time here. When I think back, on how far I’ve come and where I am standing today I get warm fuzzy’s just thinking about it. I am really lucky to achieve this!